— Carpal tunnel syndrome is a condition that causes pain and numbness in the fingers and hands, and sometimes the arms. 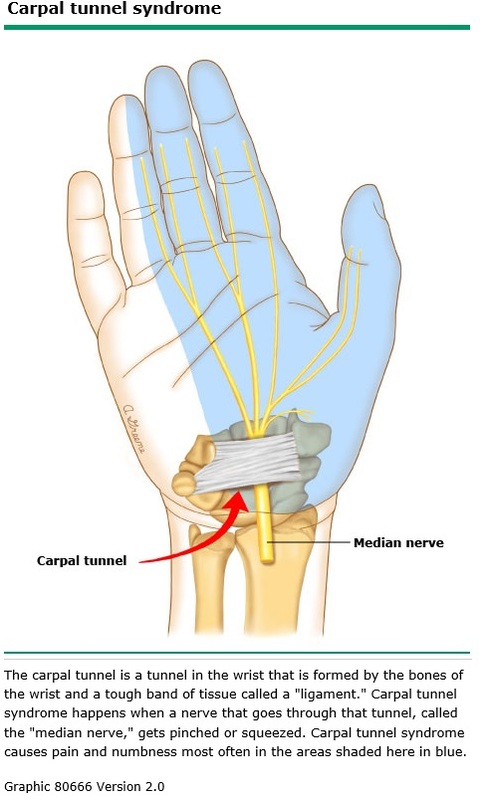 It happens when a nerve in the wrist called the “median nerve” gets pinched or squeezed. Woman are more likely than men to get carpal tunnel syndrome. Being overweight probably increases the risk of carpal tunnel syndrome. Examples of other conditions that might increase the risk include pregnancy, diabetes, and rheumatoid arthritis. What are the symptoms of carpal tunnel syndrome? — The symptoms include pain and tingling in the thumb and the index, middle, and ring fingers (figure 1). Often the symptoms affect both hands, but one hand might have worse symptoms than the other. In some cases, pain and tingling can extend to the whole hand or even up to the wrist and forearm. Rarely, pain and tingling extends past the elbow to the shoulder. In many people, the symptoms come and go. But some people eventually have symptoms all the time. They can end up having trouble moving their fingers or controlling their grip. Is there a test for carpal tunnel syndrome? — Yes. Electrical tests of the nerves can show if you have carpal tunnel syndrome, but these tests are not always necessary. Your doctor will probably be able to tell if you have carpal tunnel syndrome by learning about your symptoms and doing an exam. During the exam, he or she might tap on or press on your wrist, or ask you to hold your hands in ways that are known to make symptoms worse. Electrical nerve tests can prove if you really have carpal tunnel syndrome. Doctors usually order these tests for people who might need surgery to treat their condition. ●Nerve conduction studies – Nerve conduction studies can show whether the median nerve is carrying electrical signals the right way. In people with carpal tunnel syndrome, signals can be slow or weak. ●Electromyography – Electromyography, also called EMG, can show whether the muscles in the hand and wrist are responding the right way to electrical signals. This test is most useful in checking whether another condition besides carpal tunnel syndrome might be causing the symptoms. Should I see a doctor? — See your doctor if you develop the symptoms described above, and they bother you. ●Wrist splints – Some people feel better if they wear splints at night that keep their hands in a “neutral position.” The neutral position is when the wrist is not bent forward or backward and the fingers are curled naturally toward the palm. ●Steroid shots or pills – Steroids are a group of medicines that control inflammation and swelling. To treat carpal tunnel syndrome, doctors sometimes inject steroids into the carpal tunnel. People who do not want to get a shot can take steroids in pill form instead. But the pills are less effective than the shot. ●Other physical treatments – There is some evidence that yoga or another treatment called “carpal bone mobilization” can help people with carpal tunnel syndrome. For carpal bone mobilization, a physical or occupational therapist moves your hand or wrist around in a special way, so that the bones in the wrist move. ●Surgery – Doctors offer surgery to people who have ongoing or severe nerve damage that is causing the symptoms of carpal tunnel syndrome. Surgery for carpal tunnel syndrome involves cutting the ligament that stretches across the wrist to form the tunnel. However, women who get carpal tunnel syndrome during pregnancy usually don’t need surgery. In most cases, the symptoms gradually improve after the baby is born. Can carpal tunnel syndrome be prevented? — It’s unclear whether there is any way to prevent carpal tunnel syndrome. People sometimes think that the condition happens because they use a computer too much or do other movements repeatedly with their hands. The truth is, there is no good proof that doing repeated hand movements increases the risk of carpal tunnel syndrome. This topic retrieved from UpToDate on: May 22, 2017.